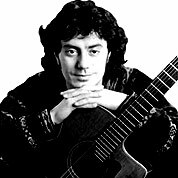 Pierre Bensusan is a French-Algerian guitarist. As sephardic Jews, his family came from Spain, Spanish Morocco and French Algeria. The genre of his acoustic guitar music is often characterized as Celtic, Folk, World music, New Age, or Chamber jazz. He has also published three books of music and tablature. A wide variety of musical styles and influences can be heard in his music.